Designed for multi-sensory learning, these multimedia lessons and activities provide students with a truly digital learning experience, and are compatible with any computer or interactive whiteboard. 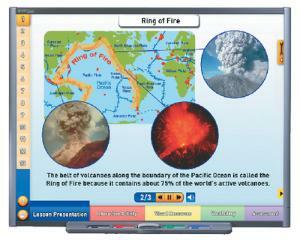 Enhance any science lesson with life-like digital graphics and animations with comprehensive coverage of topics and one-on-one student interaction and assessment. Every topic includes a digital, inquiry-based student activity guide and the following five teaching modules, plus a stimulating virtual lab investigation. Begin with a series of narrated, visual presentations of the designated topic, each featuring highly-detailed graphics and illuminating animations. Simulate a variety of real-world lab activities, plus a virtual lab investigation, using a digital Lab Activity Guide. Explore additional images for greater understanding, as well as individual graphics from the Lesson Presentation Module. Provides illustrated view of key vocabulary, allowing students to choose any of the terms along with their corresponding images and definitions. Reinforce topics covered with a series of assessment/review questions for use in either a Quiz Mode, Practice Mode or Play Mode. Compatible on Windows or Mac. Single User License and Site License for Single Building available. Dive into the captivating world of volcanoes with this interactive lessons that covers six topics including, Volcanoes & Plate Boundaries, Properties of Magma, Volcanic Eruptions, Life Cycle of a Volcano, Volcanic Landforms, Hot Springs & Geysers. Also includes Virtual Lab Investigation: Investigating Volcanoes. Recommended for grades 6-12. Meets national science standards and state standards for California, Florida, New York, and Texas.